(L to R) Bear Bellinger, Adrian Aguilar and Jenny Guse. Photo by Jeremy Rill. Rent will forever be defined as playwright Jonathan Larson's magnum opus, to date the ninth longest running stage production in history. Sadly, the night of final dress rehearsals for its off-Broadway debut, Larson succumbed to an aortic dissection, the direct result of a misdiagnosis of Marfan's syndrome. Larson's anthem, "Seasons of Love (How Do You Measure...)" certainly confirms his awareness of time itself-ticking, moving and sifting through the grates of this lifescape we cling to so tenaciously; it makes perfect sense that Larson would scribe the pebbles of his own (shortened) hourglass. tick, tick...BOOM! was originally written by Larson as a one-man musical, an autobiographical tale of a struggling young composer reaching the eve of his 30th birthday in early 1990, left wondering if he has thrown his life away pursuing his dream to see his plays in production on Broadway. Larson's death in 1996 prevented the story's conclusion of a triumphant ending, and the story would be re-tooled by playwright David Auburn. Auburn added a longtime girlfriend and a best friend/roommate to compliment the struggling Jon (Adrian Aguilar) in the telling of the days when Larson believed everything in his life was falling apart when in actuality his life's work was finally falling into place. Jon's apartment is a fifth floor walkup with a bathtub in the kitchen. His best friend since childhood, Michael (Bear Bellinger), has given up the dream of becoming a successful actor, trading it in for a upwardly mobile marketing job, and is promptly rewarded with a condo with river-view and BMW. There is a dark reckoning that Michael must face, but he's enjoying his newfound security and middle-class placement. Susan (Jenny Guse), Jon's dancer-girlfriend, is tired of city living and struggling to make ends meet, and desperately wants Jon to make a full-on commitment to their relationship along with a move to upstate New York, where wealthy children lay in wait for her tutelage, and where she can finally marry and start a family, preferably with the (very) resistant Jon. Jon has an agent so disconnected from her client, he doesn't recognize her voice on the phone, nor in-person when she attends the first table reading of one of Jon's plays. Jon's calls to his parents make for even more anxiety and self-doubt, as his father runs through a sibling "success checklist" that obviously doesn't include Jon, and at the end of the call reminds Jon that he can "always move back home." As the days pick off to Jon's 30th birthday, Michael grows more distant, Susan grows more impatient and ultimatums are meted out amongst the three. Jon cannot shake the tick, tick, tick... that only he can hear as the sound grows louder and more consistent, and Jon cannot help to wonder what it means, and why, as the days wind down to his birthday, the tick, tick, tick doesn't stop. It's a shame for a lot of reasons that Larson didn't live long enough to complete tick, tick...BOOM! in the original format he intended. A one-man band has its own intrigue, and Auburn's addition of characters and complications doesn't make for compelling storytelling. tick, tick...BOOM! is a good story, as long as we hearing Jon's "voice", uninterrupted by additional characters' POVs. Near the beginning, Jon tells us that in his 30th year, 1990, there isn't much cultural relevance going on in America; which explains why most of the songs in TTB! sound like Wilson Phillips on Broadway. The story is slightly stronger, but imagining just Jon on the piano, channeling his days of despair, would have been much more fascinating. Hopefully another playwright will come along and rewrite TTB! to the more simplistic and powerful autobiography Jonathan Larson intended it to be. 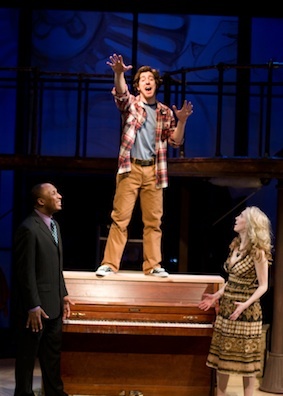 Porchlight Music Theatre presents Jonathan Larson's tick, tick...BOOM!, directed by Adam Pelty with music direction by Diana Lawrence, at Stage 773, 1225 W. Belmont Ave., April 28 to June 10. The performance schedule is Fridays at 7:30pm, Saturdays at 8pm and Sundays at 2pm. There is an additional Friday, June 1 performance at 10pm. Single tickets are $38 with group and student discounts available. All tickets are available at stage773.com, porchlightmusictheatre.org or by phone at 773-327-5252.